"The light of the Evenstar does not wax and wane. It is mine to give to whom I will. Like my heart." 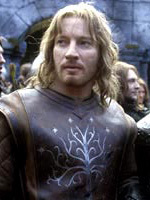 David Wenham plays Faramir, Boromir's brother. David Wenham was born on September 21, 1965, in Marrickville, a suburb of Sydney in New South Wales, Australia. He is a part of a large family, being the youngest of 7 children having five older sisters and one older brother. He has commented that when he was growing up, he always wanted to be a performer. He says that he was forever entertaining people, probably because he felt he was not very good at anything else. He eventually followed his dream and attended the Australian Western University where he learned his trade as an actor. He had excellent training and showed immense talent which helped him land a role on the popular 1980’s TV Series ‘Sons and Daughters’, as well as other roles on stage, after leaving the university. From then on it was an upward curve for David, becoming best known and loved for his role as Diver Dan in the comedy-drama series ‘Seachange’, for which he was named as an AFI nominee. David has now acted professionally for roughly twenty years and has been critically acclaimed in Australia for his diverse roles in TV, stage, and films; receiving numerous Award Nominations in the process and winning Best Actor in a Leading Role in 1997 for the TV Drama Series ‘Simone de Beauvoir’s Babies’. He had several films released in America during 2002 including ‘Moulin Rouge’ and ‘The Crocodile Hunter: Collision Course’ starring Steve Irwin, where he was finally able to catch the eye of mainstream audiences. Following major exposure and Peter Jackson seeing his performance in ‘The Boys’, he secured the part of Faramir in The Lord of the Rings Trilogy: The Two Towers, and The Return of The King. Other interesting facts about David is he has, in his time, been a Bingo caller in Sydney’s Marrickville Town hall and also an Insurance Clerk. He apparently likes nothing better than hanging out at Sidney’s Rushcutters Bay Park and Café Zinc at Potts Point. He has been quoted saying that he ‘likes cooking, but likes other peoples cooking more’ and that his ‘life at the moment is like his wardrobe – organised chaos’. As a point of interest, in March 2002, David signed up as an Ancient Forest Guardian in Sydney together with Australian acting luminary Sam Niell.